Are you a traveller working on the move? Are you busy building your business venture and need an affordable yet soulful accommodation in the heart of Hanoi? Then look no further! Situated in the most most expensive neighbourhood at the moment in Hanoi given the location and the atmosphere. Though it's in the Old Quarters but very quiet at night, and not busy in the morning. During weekends you can enjoy a long walk around Hoan Kiem Lake since Hanoi forbids all transportations on Friday nights, Saturday and Sunday. The atmosphere is purely priceless. We have a beautiful workspace in our hostel where you can spend the day working peacefully on your business. 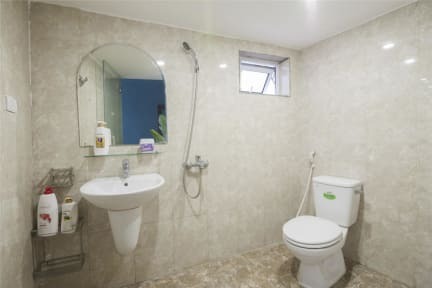 Please bear in mind we are not a party hostel, our concept and core business value is to provide a chilling, well-decorated, relaxing place for travellers to feel like home. There are comments complaining about our atmosphere and facilities simply because we play jazz as background music and no bars, just coworking space (we have beer though). 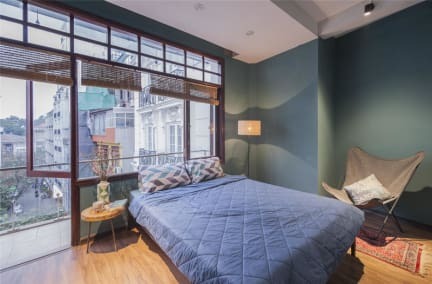 If you are looking for a sparkling clean, beautiful, chill, in the centre of Hanoi, to come back having a deep sleep and sometimes working while you are away, we are the perfect home for you. If you are looking for somewhere vibrant with party activities, we are not the good fit. This is a very great place to stay in Hanoi. I will come back for sure! I am a solo traveller and have been to quiet a few places, most of them are noisy and stinky of alcohol and smokes. Satori is unlike any other hostel, it feels like home, they only have a dorm room of 12 people, and a coworking space outside. We go out to party and go back to Satori to sleep and work. Staff are enthusiastic, their English is not very good but those ladies are really trying to help. I got food poisoning and they went to buy medicine and made me ginger tea! A great location in the center of old quarter, close to all the action that happens in Hanoi. Clean dorms & bathrooms, great wifi and a cozy co-working space with quirky balconies overlooking the restaurants in the area. Overall a very chilled and relaxed vibe to the place. Office staff was very eager to help 😊 !! Note on Hanoi: Use 'Grab' to book taxis. Satori is a mixed bag. There were some issues, aircon stopped working and was pooling water on the floor beneath, it was however fixed fairly promptly. The WiFi was pretty awful, might as well have not even offered it. Breakfast is simple and fine, but because of the hostels great location, good food and drink is seconds away. And the staff are great, especially the young dude working the desk who's name I've sadly forgotten, he was incredibly helpful and friendly, damn good employee. The place was nice, just one room. If u need to relax this is the place to be, not to meet other travellers. The staff were trying to be helpful but seemed a bit flustered by everything and forgot to book us a cab when we were supposed to be going to the airport at 3am. The private room could have been nice but it was damp and there was water running down the wall when it rained. The bathroom had ants and no hot water. The hostel is locked at night which means you have to wake up the staff to let you in if you come back after 11pm - this wasn’t a problem though and I guess makes it more secure. Can smell the cigarette all the time. The keys always stuck when I try to lock the door but staff really helpful. Little or no atmosphere. Was first in a private room and then a dorm. Love the pod concept in the dorm. Needs more consistent customer service and for the person behind the desk to speak better english. I advised property few days in advance that I will arrive 15-30 mins late and they confirmed it was fine and they will wait. I arrived as agreed and no one was there, I am a female traveler stuck in Hanoi (just arrived into Vietnam) at night with no mobile data and no place to stay.. next day I reached out to hostel world but they were useless, didn’t help at all with the situation. In the end they still charged for the night I didn’t stay.. and no one even cared about what I had to go through..